Rivendell Theatre Ensemble, in association with Waltzing Mechanics, presents the World Premiere of BODY/COURAGE. When I saw Danielle Pinnock’s 2015 workshop, I was impressed by her multiple characters. After experiencing the world premiere this week, I am stunned by her depth of character. 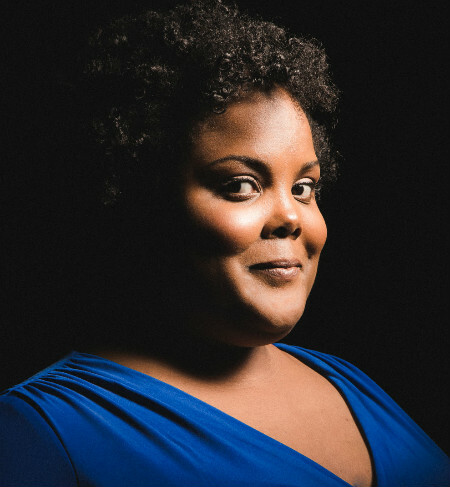 As her graduate thesis, Pinnock has interviewed over 300 people to learn how they feel about their bodies. From that project, she wrote a show featuring some of her most memorable subjects. A woman hating her freckles. A bulimic selecting ice cream. A dude talking sexual conquests. MC Obese rapping about weight. Tan Mom defending her parenting antics. Black or white, British or American, male or female, Pinnock transforms into several distinct characters. With minimal props and without much time, she embodies a completely different person. She is a tremendously gifted storyteller. And her one woman show last year was full of humor and insight about different individual’s obsessions with their physical imperfections. I loved it! In this world premiere, Pinnock still engages with her various impersonations. Yet this time, she also delves into her own story. Weaved through the entire show, Pinnock talks about her personal struggles with weight. She navigates us through decades of dieting influenced by her grandmothers, her mother and her father. We meet these significant family members through conversations she has with herself. Not only are we able to see and hear the distinction between Pinnock’s mother and Pinnock, we can tell what age Pinnock is. Her face lights up as a little girl. Her eyes roll up as an angsty teen. We see her. We hear her. We know her…the real her. Pinnock opens up the family scrapbook and gives us the real picture of growing up fat. She recollects with bold honesty a tragic night of Hennessey drinking. Under the skillful direction of Megan Carney, Pinnock stays true to her own painful past. After a shocking reveal, Pinnock courageously pauses to allow us to comprehend what she just said. We need to swallow hard and blink back tears. The woman behind me was weeping. Pinnock allows us to see her own fragility rooted in body-oriented self esteem. Her inventory of this dark life chapter continues to haunt me. Pinnock’s storytelling is universal/personal, funny/poignant, playful/disturbing, beautiful/powerful. I highly highly recommend Danielle Pinnock’s BODY/COURAGE.